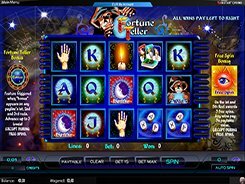 Fortune Teller is a 5-reel 15-payline slot powered by Amaya and themed around fortunetelling, as the slot name suggests. The symbol set incorporates traditional playing cards depicted inside magic orbs, a candle, a palm, Tarot cards and other theme related icons. A credit value is adjusted from $0.01 to $0.25, with up to 10 credits accepted per each of the lines, so the minimum and maximum stakes are $0.15 and $37.5 per spin. The slot has a free spin feature that is unlocked if you roll up the Eye in the Pyramid symbol on the first and fifth reels simultaneously. Besides, there is a wild symbol in the slot that acts as a replacement for all regular symbols and awards the biggest prize of 10,000 coins ($25,000 on the maximum stake). Hitting three Bonus symbols on adjoining reels activates the Fortune Teller bonus feature that is played on the second screen and designed as a wheel of fortune game. In conclusion, the slot will appeal to all categories of players including beginners and pros alike. PLAY FOR REAL MONEY!